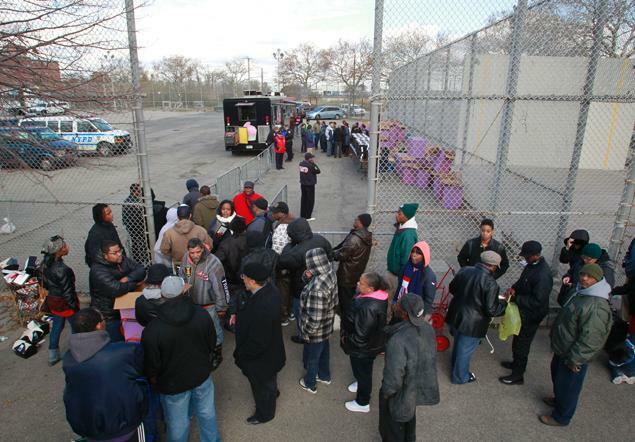 Far Rockaway residents fall in line as FEMA gives out food and water at Beach 49th and Beach Channel Drive in Far Rockaway, New York on Friday, November 2, 2012. The wave of destruction that that descended upon the Rockaways in the wake of Hurricane Sandy, compounded by government neglect and the absence of official aid organizations, is not the first time that section of the city has been overcome with violence and fear. The wave of arson and disinvestment that swept through the Bronx, Harlem and large portions of Brooklyn during the early and mid 1970’s also took a terrible toll on the Rockaways, though I never saw it mentioned at the time, or for that matter in the historical literature about those difficult years in New York’s History. I experienced this first hand in 1979 when I drove out to Rockaway to interview a former NYC school teacher and union activist, named Alice Citron, for my book Communists in Harlem During the Depression. Her address put her in a section of Rockaway, Edgemere, where I had spent many summers as a child staying in the bungalow of my grandfather, who was a garment worker. Although the bungalows were wooden, and in retrospect, extremely modest, I remember magical days and nights in that area in the early 50’s, running into the surf, playing ski-ball on the boardwalk, eating delicious knishes, and listening to the adults political arguments. The area had been packed with people, almost all of them Jewish, who had survived the Depression and were enjoying a first taste of prosperity and security. It was a joyous place. Now, in 1979, it had the atmosphere of a ghost town. Alice Citron’s house stood on a beach block where 90 percent of the land consisted of vacant lots, with only three houses standing. Across the el tracks, near the bay side, stood a large public housing project. When I rang the door bell, Alice and her husband came to the door, accompanied by two huge dogs. Before we started her interview, which focused on the role Communist teachers played in fighting for better schools in Harlem and the teaching of Black history, she told me what the neighborhood was like today. Rockaway had become the land that God , and the city of New York, had forgotten. In the housing projects across the street, senior citizens, most of them black, were trapped in their apartments by fear of crime. The Citrons with their huge dogs, and their car, sometimes shopped for them, and brought them to the doctor when they were sick. The neighborhood had become a kind of urban concentration camp for the poor, a place where the beauty of the surroundings was little compensation for fear, neglect, and the absence of basic neighborhood amenities. The Citrons, who had lost their jobs during the McCarthy area didn’t have the money to move out so they stayed and helped their neighbors cope. They were in their 70s then, and had no where else to go. For years after, I was haunted by what I saw that day, and what it told me about class and race in New York City. Ten years later, when I was coaching CYO basketball, I returned with a team from Park Slope to play a game at a Catholic parish not far from the Citron home, St. Rose of Lima, but I didn’t have the time to drive around. I never found out if the neighborhood had been rebuilt, or whether life had gotten better in the projects of the Rockaway Peninsula. Now, with reports of residents living without power, food, and water, surrounded by piles of debris the storm had scattered, terrified of crime, the memories of that visit came rushing back and along with it, the rage and frustration I had felt at the time. Once again, the people of Rockaway were being neglected. Once again, they were reminded because of their color and economic status, they were not really “citizens.” And once again, they were living in the land that God, and the City of New York had forgotten.